A new research collaboration between New Jersey Institute of Technology (NJIT), Louisiana State University (LSU) and University of Florida is set to launch the first evolutionary study of the unique pelvic structure and walking mechanics of blind cavefish (Cryptotora thamicola) — the only living species of fish known capable of walking on land similarly to four-limbed mammal and amphibian vertebrates, or tetrapods. The National Science Foundation has announced the project, titled “A Phylogenomically-Based Bioinspired Robotic Model Approach to Addressing the Evolution of Terrestrial Locomotion,” will receive a four-year, $997,510 grant to examine the phylogenomic relationships, morphology, biomechanics and walking performance of the blind cavefish and its relatives, from an evolutionary perspective. Researchers say the project’s unprecedented, comprehensive study of the cavefish’s vertebrate-like pelvic girdle and phylogeny may provide a new window into the evolution of appendages, pelvis and vertebral column that ancient tetrapod fishes needed to transition to terrestrial life during the Devonian period, between 350 and 400 million years ago. The research collaboration will aim to identify the morphological, genomic and mechanical qualities of walking cavefish that may have enabled other early fishes to walk on land. University of Florida researchers, led by Larry Page, Florida Museum of Natural History curator of fishes and affiliate professor of biology, will lead the study’s morphological study and collection effort from as many as 238 fish species that share the same family as Cryptotora thamicola, known as the Balitoridae, for comparative analysis. The morphological analysis will reveal how as a generality, functional phenotypic adaptations can be formed by genomic changes. 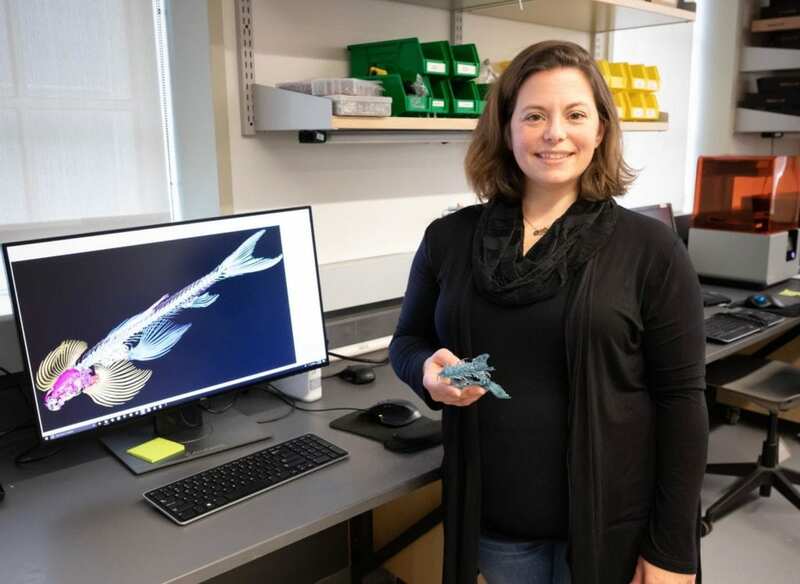 Flammang’s lab will use phylogenomic, morphological and experimental biomechanical data to create a biorobotic model of the fish. The robotic model will be used to examine possible instances of evolutionary convergence and answer questions on the effect of pelvic morphology on walking performance in extinct fin-to-limb transitional species forms, as well as modern forms.